Wheely Guitars has unveiled the Wheely, the world’s first guitar designed to be played in a wheelchair. Made in the USA, the Wheely’s patent-pending design allows guitarists to play comfortably, thanks to chair arm, leg and belly relief; a comfort neck carve; and custom jack position, to allow for chair arm cable clearance. Spec-wise, it features an alder body, three-piece Eastern hard-rock maple neck and 25.5” rosewood fingerboard, as well as a Hipshot through-body fixed bridge, zero fret and Seymour Duncan pickups. You can watch Team USA wheelchair basketball gold medalist Abby Dunkin demo a Wheely guitar in the video above. 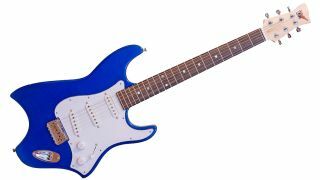 The Wheely is available to order now for $1,200 from Wheely Guitars, in Burnout Blue, Hot Rod Red, Racetrack Black and Wheely White finishes.